It was a fresh morning but turned out to be a most beautiful sunny winter day which was great because my brother Robbie was with us visiting from Adelaide. I was visiting family in Adelaide only the week before and can’t say the same for the miserable weather there. It’s nice to see the wattles flowering at this time of year and as usual there were plenty of Sunday cyclists out with an ambulance in attendance where one had come to some grief. Hopefully nothing too serious. We took the 65 Riviera and the recently fixed cruise control (or as Buick called it – Electro Cruise) very handy feature and quite amazing for their day. 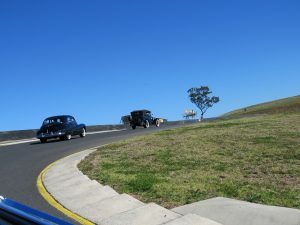 Traffic was good arriving at Sydney Motorsport Park within 45 mins of departure from Davidson. This is a huge Shannons sponsored event run by the CMC (Council of Motor Clubs NSW) with a total of 1,700 cars and a healthy number of 20 Buicks. Camp Buick set up at the backs of the cars to sit in the sun, chat, have morning tea on offer from some Buick cooks and later on, lunch. Hard to find Coffee outlet with rather long lines and wait times. Frustrating, but our CMC rep will pass that feedback on to the executive and hopefully they will address this for next year. The traditional medallions were not in the goodies bags this year but had to be collected from the CMC Garage. Along with a lucky door ticket, this was a great ploy to get people through all the garage displays. This year there was a vast variety of market stalls with something for everyone. We were entertained all day with lovely music by a great Police band nearby at just the right volume. Most of the cars lined up for their turn on the track at 10.30am and the vintage double decker buses were also running around the track for a gold coin donation. Many of the car marques were celebrating special anniversaries. The winner of the Concours was a Holden Ute. Visitors of the Day: Warren & Andrew Plowright from Pt Macquarie who were collecting their 71 Riviera which they had purchased during the week form fellow member Richard Mintrom. Paul Camileri and Mike Belfield also popped by. By 3pm the cars were thinning out and we left the venue very satisfied with the day’s activities and fellowship. Highly recommended event and hope to see you there next year.